Having family in different states, we travel quite a bit. Our kids have been on more airplanes than many adults I know. We have road tripped with our oldest a few times, but only once that was longer than about 5 hours and we drove through the night when she was 6 months, so she slept the whole way. 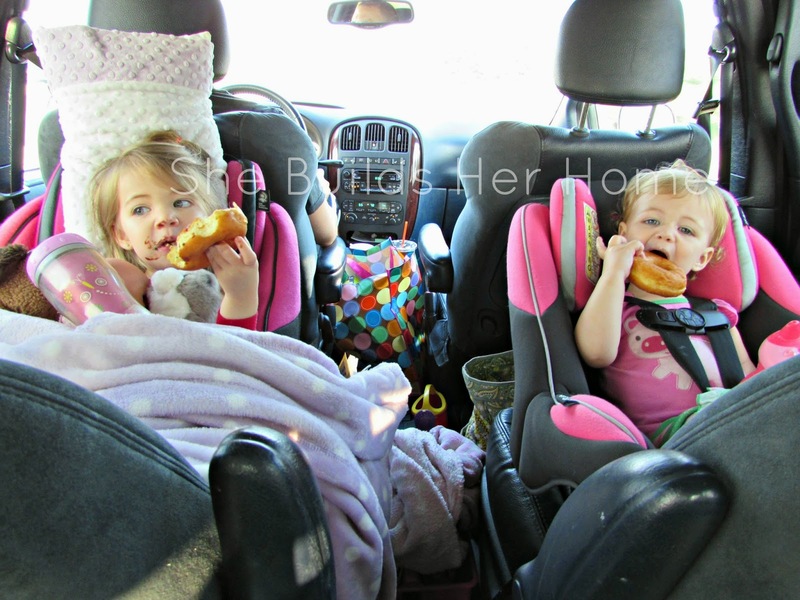 We planned to go to Colorado over Labor Day weekend and I was pretty nervous about how two toddlers would do on an 800 mile drive! I've made that drive millions of times, but traveling with little ones adds a whole new dimension to things. I started searching Pinterest and googling activities for toddlers to do on a road trip and I couldn't find anything! All of the awesome road trip pins were for older kids. Things like maps, abc games, find the licence plate games, etc. Those require reading skills and to not be rear facing in a car seat so I was on my own. Hopefully this will help someone else who is traveling with little ones a long distance! These ended up being perfect for the trip. Even though my girls couldn't reach them on their own since they face backwards, I had everything at my finger tips to hand them whatever they wanted, or when they got bored to choose an activity for them. 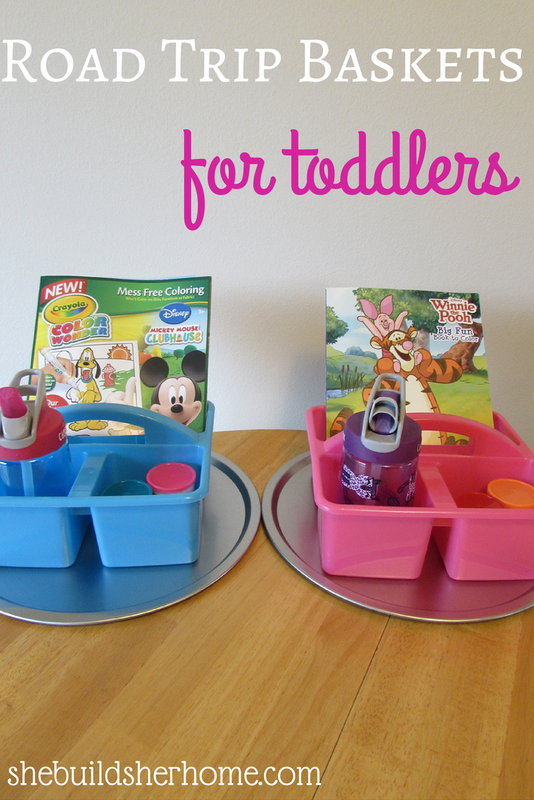 If your kids are even a little older than mind, these would be amazing so they could keep it by their seat and get what they want! Other things I brought to keep my kids busy for 12+ hours: books. Millions of books. Magna Doodles, coloring books, snacks, drinks, file folder games, family stick people, cookie sheets from the dollar tree, and electronics. We aren't opposed to electronics, but we usually try to save them for the last leg of our trip where everyone is losing their minds! It worked out that on the way there my younger daughter fell asleep so we let the older one watch a show with headphones on. Then when little one woke up, we turned it off and they each got to watch something when we were in the last hour and a half or so and everyone was over it. 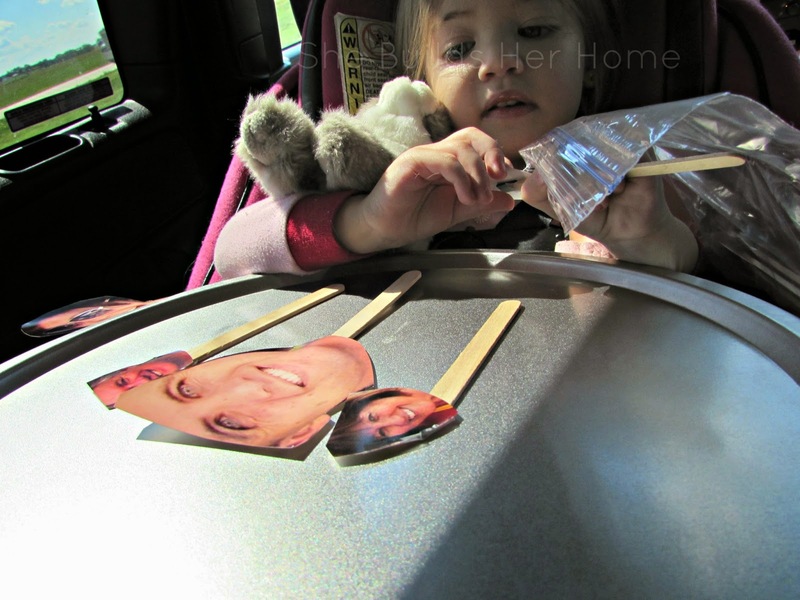 Other tips I have for a smooth trip and keeping toddlers entertained... 1. Feed them in the car. A lot of things I read said take an hour for lunch and let them eat and play, etc. We stopped for about a half hour and let them run around in the grass, play ring around the rosie, etc. then went through a drive through and fed them lunch in the car (one of us was in the back helping them). This killed at least 30 minutes of drive time for EACH meal. So that was about 1 1/2 hours total each day that we just spent eating and busy with that. 3. If you have a large enough car, have one of the parents climb in the back occasionally. When the girls would start going stir crazy, my husband or I would climb into the back seat and read them stories or sign songs with them. We did this for meals, too. 4. Cookie sheets. If your kids are learning ABCs, bring letter magnets. I made these little stick people with our family's faces and my girls had a BLAST playing with them. Just put a popsicle stick and magnet on the back and they played with these for a long time. With my 3 year old, I started asking her to group people together based on who they live with, etc. We also used these as a hard surface for coloring, and for doing play doh. They were great! 5. Keep bags with like items. Even though I probably had more bags this way, it was nice to have one big tote of the girls activities, one bag for food and one bag with our stuff (books, laptop, etc.) so that when someone asked me for something, I wasn't digging through everything trying to find the headphones. I'm happy to say that we survived the road trip well. My kids were total rock stars and didn't complain at all. I think it definitely helped that we were prepared and they had plenty to do. They spent a little over 24 hours total in the car in a 5 day period. We are road tripping down to Texas for Thanksgiving, which is 2 days each way so I'm glad to know that they will be able to handle it! 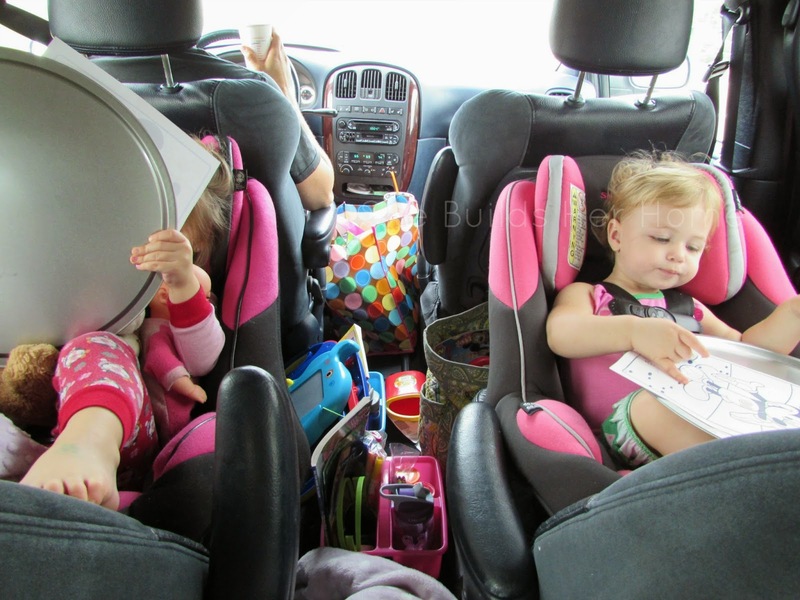 Do you have any other road tripping with toddlers tips? Wow! So awesome. So far only videos on our portable DVD player or looking out the window will keep our boys busy and happy. I have those colour wonder books and Henry will scribble for like 2 minutes and then say he's done. And I would NEVEr trust them with play doe in the car! They would eat it or mush it into the seats. Your girls are such little angels!! Love the file folder games! I will have to try those next time.